The Original MantleClip® stocking holder's sophisticated low profile design won't interfere with other Christmas decor displayed on the mantel, such as Christmas villages or garlands. So feel free to decorate your mantel as you wish without your stocking hangers getting in the way of your festive holiday display or TV above the mantel! What's more, these stocking holders are a good choice for households with pets and small children. Ordinary stocking holders often consist of very heavy weights which can fall on curious children or pets. These amazing MantleClipTM stocking holders are the answer! 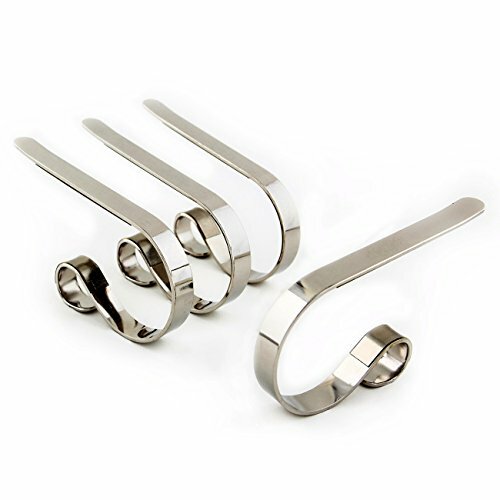 Weighing only a few ounces each, these durable clips hold stockings in place safely and securely. With their sturdy metal construction, they support even the fullest stockings. Clear soft gripper pads hold them in place while protecting the mantel surface from scratches. Use these versatile stocking holders to display Christmas stockings, holiday ornaments and colorful garlands. When the Christmas season is over, keep them on hand and you will be surprised at the number of additional uses you will find for them! The Original MantleClip® stocking holder fits a variety of mantel types and can even expand to fit ledges up to 3 inches thick. The Original MantleClip® is a registered trademark of Haute Decor. The Original MantleClip® stocking holder has a sophisticated low profile design that won't interfere with other Christmas decor on the mantel. Adjustable to fit most mantel ledges from 1.5 to 3 inches thick. Clear gripper pads hold tight and protect the mantel surface. Lightweight yet holds even the fullest stockings (up to 10 lbs). It is a safe choice for households with children and pets.